DETROIT -- Hundreds of North American auto-parts makers may fail within months as a weakening economy forces automakers to slash production, the CEO of Canadas second-largest supplier said. 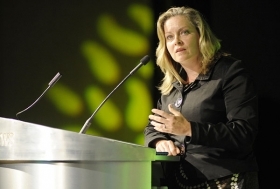 We will see fewer OEMs and fewer suppliers either as a result of irreparable financial distress or for some as a result of a strategic shift out of the automotive industry, Linamar Corp.s Linda Hasenfratz told the Automotive News World Congress tonight. In recent days, at least three Michican suppliers have sought bankruptcy protection or liquidation. Checker Motors Corp., the auto-parts maker that once produced the Checker taxi cab, filed for Chapter 11 bankruptcy on Jan. 16. That same day, electronics supplier May & Scofield LLC shut down after Bank of America foreclosed on its U.S. assets, the Associated Press reported. In addition, Specialty Motors Holding Corp. filed for Chapter 7 liquidation. The immediate future is a fairly gloomy place, said Hasenfratz, who is also chairman of the Original Equipment Suppliers Association. But once the market turns back up, with fewer suppliers and rising production, we all have a future to focus on, she said. Hasenfratz called on government and union support along with more cost cutting among her supplier peers to rescue the auto industry. She also said suppliers should follow Linamar's lead in rapidly and deeply cutting costs, reducing staff and overhead to match new sales levels while focusing on "diversifying our businesses to take our skills to markets that need us." "Suppliers are really a step ahead of the process, having already taken the haircut that the government is now looking to other parties to sign up to accept," she said. She applauded contractual changes from the UAW, but called on labor "to come to the table with further concessions to create a competitive cost environment for these companies to operate in." Government is the next target in her sights. Hasenfratz, and the association that she chairs, are following automakers in seeking government help. Their first priority is "quick pay," she said. She would allow automakers to tap the Troubled Asset Relief Program, or TARP, funds if they would agree to pay suppliers more quickly. "This is an easy, simple way to put more cash in supplier's hands today," she said. Another priority, she said, is government guarantees for suppliers' receivables. This would improve access to supplier financing. The third priority, she said, would aid suppliers by allowing them access to bridge loans or access to credit lines through TARP. Lastly, she said, OESA is advocating that the government provide debtor-in-possession financing in the event a supplier enters Chapter 11 reorganization. Hasenfratz cautioned against protectionist policies creeping into government- backed solutions. "It is common knowledge that protectionist trade policies were a key factor in the escalation of the Great Depression. Let's not make those same mistakes again," she said. Linamar has 37 plants in Canada, the United States, the United Kingdom, Mexico, Germany, Sweden, Hungary, China, Korea and Japan. Linamar, a global supplier of powertrain parts, ranked No. 41 on the Automotive News list of the 150 largest suppliers of parts to North American automakers with estimated sales of $1.38 billion in 2007.